The Port of Kaohsiung is the largest harbour in Taiwan. This port is also the “Takau Port” in history (wikipedia). Our cultural boat from Pier-2 to Hongmaogang travelled through the port and we could enjoy the harbour views the whole way. Harbour view with city skyline. Just wonder how it looks later. Kaohsiung Exhibition Center and China Steel Building. I couldn’t set the route of our boat on Google Map. 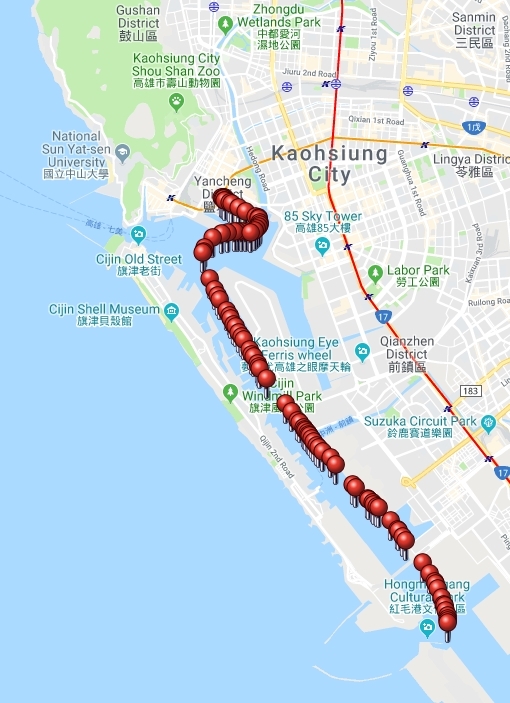 Thus, I used Map Utility of Canon to mark the GPS-coordinates of my photos to visualise our route through Kaohsiung Harbour.